Posted on Sat, Mar 6, 2010 : 6:41 p.m. 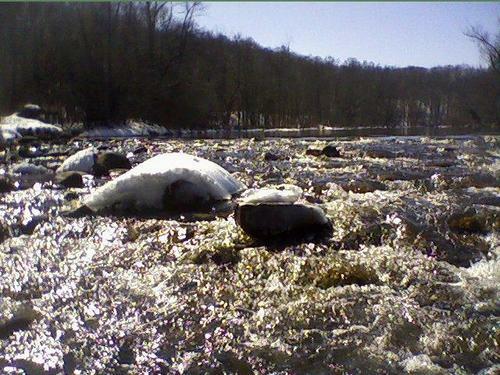 The rapids at Tubbs Road from the Huron River, photo taken Friday, March 5, 2010. Early March holds lots of potential, but not a lot of reality for foraging. So an afternoon canoe trip yesterday resulted in totally different findings. My longing for paddling increased each time I passed by the open water of the Huron, so I was happy that my foraging friend agreed to an afternoon in a canoe on the water. We found a spot well above Barton Dam with no ice shelf extending into the river, so that we could make an easy put in. His canoe was frozen in place in his side yard, so this was actually a borrowed canoe. Now, would sensible people continue with a canoe adventure when even the canoe is too frozen to use? Absolutely. The one concession I make to winter canoeing is I wear a Personal Flotation Device (PFD) without fail. I’m a strong long distance swimmer, and am well aware that that is only a slight (and insufficient) advantage if the water is near ice cold. Wearing the PFD and having a dry bag with a change of clothes inside are essential. Having basic paddling skills and experience in canoe safety and hours of practice keeping a canoe upright also make for a safer experience. The author, wearing her PFD, canoeing yesterday on the Huron River. 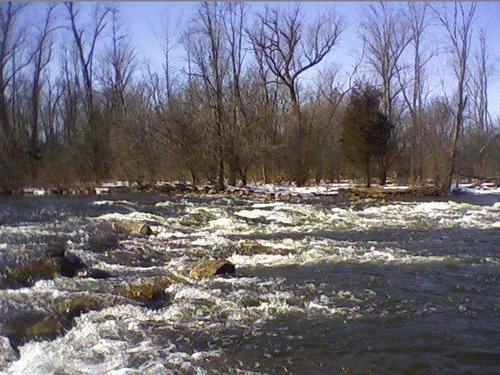 The sun was shining when we launched from one of the pullouts off Huron River Drive - a bit of wind, but it was an easy paddle upriver. Right away we started seeing the ubiquitous swans and ducks that have over wintered along the Huron. But within their masses the bufflehead ducks were obvious. They are a far more shy bird, and took flight when we were still far away. Their quick short flapping makes the ID even more obvious. I’ve had the experience of chasing them down the river; they fly a short distance and then spook over and over. They look and act almost panicked when they stir and fly, I always want to reassure them I mean no harm. The migrating bufflehead was joined later by a common merganser that we also spotted. Seeing migrating birds is another way to mark the progression of the season. They come and go on their own timing and their internal knowledge, and it seems worth marking for those off us who rely so heavily on calendars and set times. Just a little way up river, a large pileated woodpecker crossed right in front of us and landed on the trunk of a tree near shore. I was able to have a nice long look at it - it changed trees and was easy to track with no foliage to hide behind. There were dozens of robins on the bank, conveying a happy energy as they hopped about on the warming ground. Muskrats were plentiful, perched on the edge of the ice shelf. There was a group of three deer in someone’s lawn sloping down to the water. They turned their white tails to us and were quickly gone. A kingfisher was easy to spot in a tall tree, and a hawk circled above our canoe around and round - it was easy to catch the flash of its red tail. We passed a bank full of the purple and green of emerging skunk cabbage. Not a foraging find - it isn’t edible - but still exciting to see because it is a clear sign that the plants are waking up after a long winter. From a canoe, looking across the rapids at Tubbs Rd. March 5, 2010. We paddled hard upstream to then pause at the Tubbs Road rapids. The photos were taken there by cell phone since my camera failed. I wish the sound of the water over the rocks was also captured. It is just joy to pause by even a small stream where it falls and sings. And this time of year, the water against ice can also make extraordinary sounds. Two years ago, kayaking on a lake in January, the wind against the ice was a combination of the sound of hundreds of crystal glasses being played, with the overtone of spring frogs. It was a rare and transporting aural experience I hope to encounter again. Ice can make amazing sounds, all unexpected and new since the conditions of ice, water, wind and temperature are so quickly changing. A short diversion up Honey Creek gave my foraging friend a quick glimpse of a mink slinking under water to hide. I missed it. Coming downriver was a bit quicker, although the current was slight in that wide part of the river. I had in mind that we would go downriver until the ice stopped us, somewhere below the Foster Bridge. When we made the turn we could see hundreds of mallards, swans, more muskrats and geese on one of the large ice shelves coming into the river. And, of course, those easily spooked buffleheads. It seemed a shame to paddle by and roust everyone, so we turned back and paddled for the put in. The final list of living creatures that we spotted was Canada goose, mute swan, mallard, crow, robin, chickadee, red tailed hawk, pileated woodpecker, belted kingfisher, common merganser, bufflehead, muskrat, mink, wood chuck, squirrel and deer. Green growing living plants? Skunk cabbage and a bit of moss. Not much else. But there are signs: the sap rising, the wildlife emerging, the river open closer and closer to Barton Dam, the migrating birds beginning to return. There is another cycle of hope and renewal. I am so glad I was able to be out on the water to be a part of it. Linda Diane Feldt is a local Holistic Health Practitioner, teacher and writer. 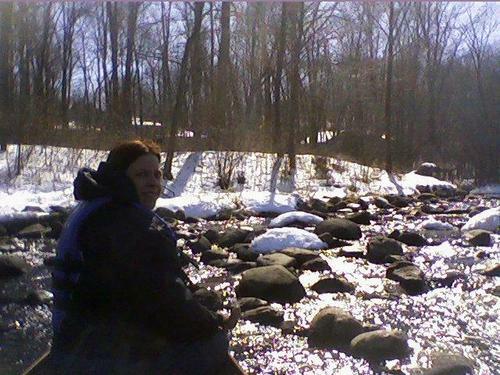 You can follow her daily tweets on local wild foods twitter.com/wildcrafting or learn more from her Web site.